Office Hours 9 am – 4 pm Mon-Thursday and Friday 9 am to noon. Calls are returned within 24 hours if answered by the answering service. Mailing location: 701 McMillian Way NW, Ste. A, Huntsville, AL 35806. We accept most major credit cards, cash or check at the time of visit. 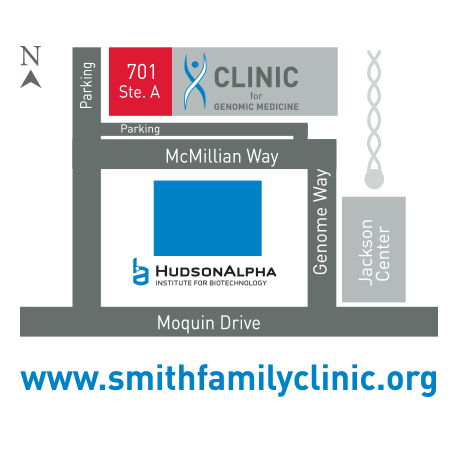 The Smith Family Clinic for Genomic Medicine is located in Cummings Research Park, behind HudsonAlpha Institute for Biotechnology. 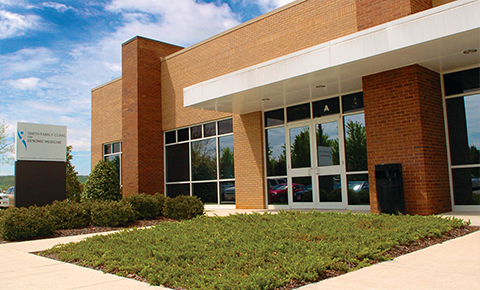 Enter the main entrance to HudsonAlpha, proceed past the Jackson Center on the right and then make a left onto McMillian Way. The clinic is located at the end of the building in Suite A. Parking is available in front of the clinic or at the side parking lot.